BrickLists provide a way to create lists of sets that can be viewed and shared with others. Typically, they are used where the sets in question can't be listed together using other methods, such as by searching for a particular theme, year or tag, or by creating a query. Anyone can create them and, if appropriate, make them discoverable by other users. I had originally planned on posting this tutorial a month or so ago but while preparing to do so I felt that creating them was not as easy as it should be so I made some usability improvements first. This article will explain how to make BrickLists as well as introducing a number of new features. It also provides some best practice guidelines for when it is and isn't appropriate to use them. Before you can create one you need to log in. Once you've done so you'll find a BrickLists entry in My Menu. If you've not created any before the page will be mostly empty, with just a link to create a new one. Clicking on the link above will open the Create BrickList page. Here you can give your list a title and description: enter something that's useful to you and others, if you intend to share it. 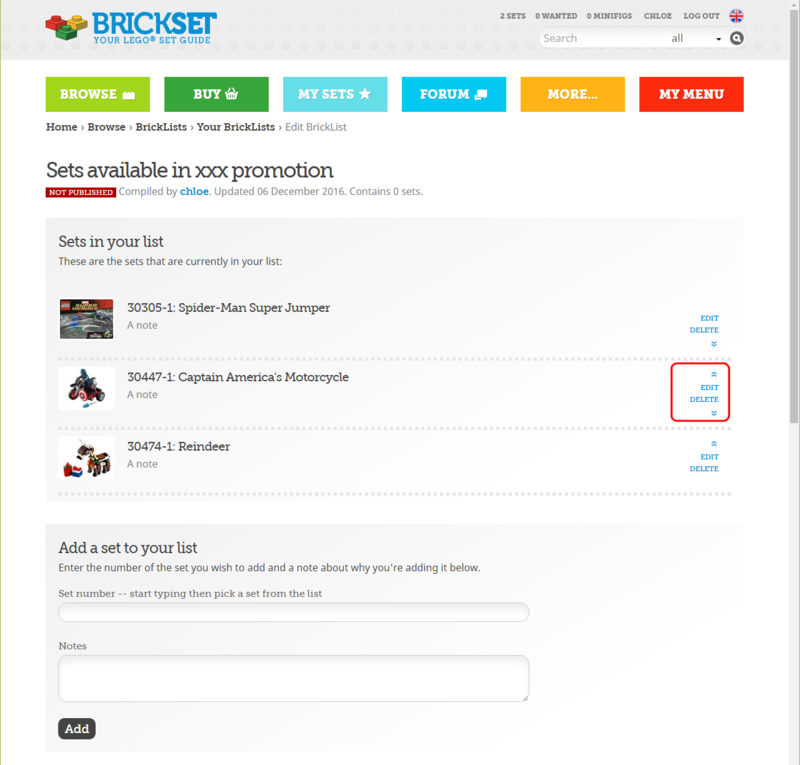 Click the Create BrickList button when you've done so. 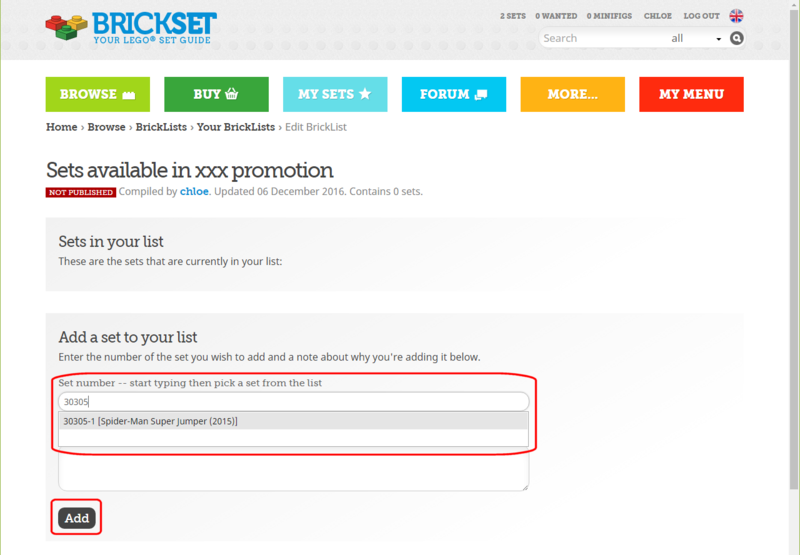 Teh list will be created and you'll be taken to a page to allow you to add sets to your list. To do so, simply type a set number or part of a set name. When you've entered three characters or numbers a list will pop up showing you matches from the database. Select the appropriate one, add a note to explain why you've added the set to the list in the box below, then press Add. As you add sets, the list at the top of the page will show them in the order that you added them. Links for moving sets up and down the list, and editing/deleting them are provided on the right hand side. At the bottom of the page you'll see buttons that provide a quick way to sort the list by set number or year released. These actions are not reversible so once you've clicked one you'll be asked to confirm that you really want to. 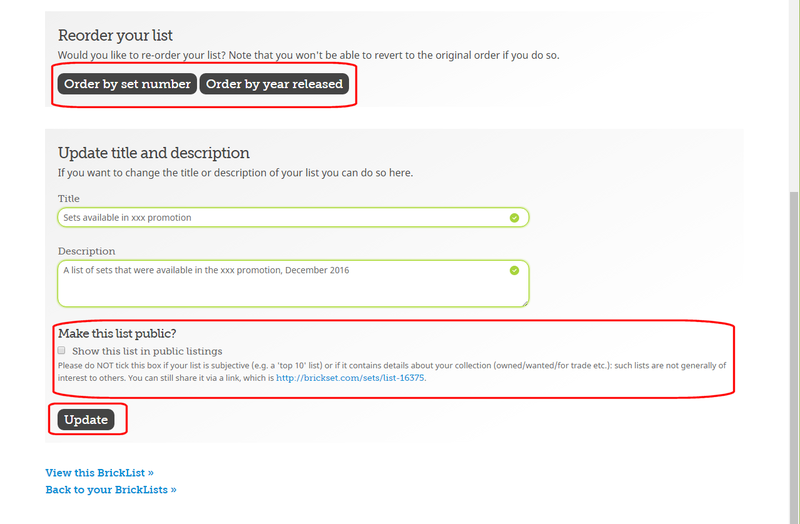 Below them is a form that allows you to change the title and description of the list should you wish to, and also a checkbox to make the list public and listed on the site. Note that you should ONLY do this is the list is of genuine interest to others, and not if it's wish list, or 'top 10' or something like that. See the best practices section below for more guidance on this. Regardless of the setting you can still share it with others using the link provided just below it. There's an Edit link on the right-hand side that takes you back to the form above so you can add more sets to it. Your newly created list will also be shown on your BrickLists page which also has an edit link, and one to delete the list. It is now possible to create and service your BrickLists directly from set listings. 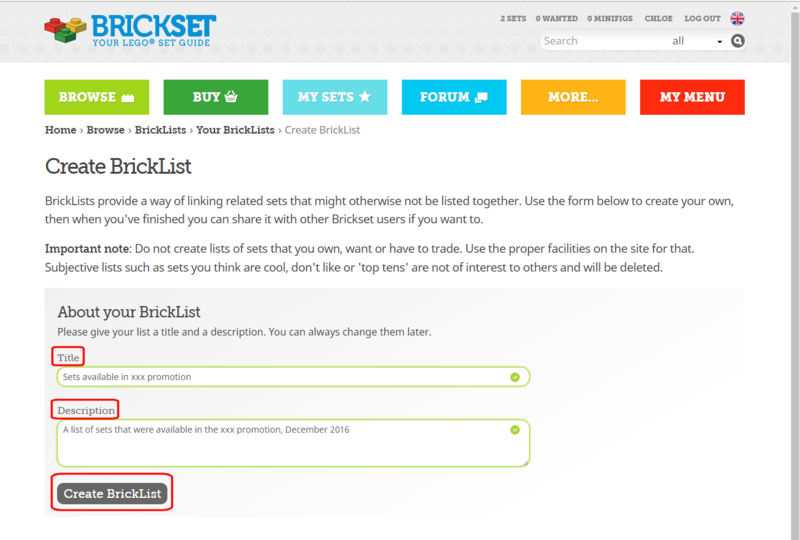 In the right-hand column of the list view you will now find a Add set to a BrickList >> link. You can browse all public BrickLists, and those you've created, from the Browse menu. This will show yours, featured BrickLists, the most helpful lists as well as the latest ones. When viewing BrickLists you have the ability to mark them as helpful. Please do so: it provides feedback to the creator and also enables the most helpful ones to be more prominently displayed. Best practices: What should you use BrickLists for? BrickLists are intended to link sets together that can't be linked in another way. You could create one to record the sets you own, but there's no point because there a better ways to do so. We won't stop you from doing so but we will remove them from the public listings as they are of no interest to anyone else. Sets designed by me -- if you're a LEGO set designer then, please, create a list! Make it public and we'll also mark it as featured so that it's easily found by others. List of Technic tractors -- Creating lists of similar sets used to be a good use for BrickLists but tags have generally made them obsolete. Nevertheless, there will be times when that's not the case. My favourite sets/Top 10 Star Wars sets/Sets I don't like -- By all means make subjective lists such as this but do not make them public: they are generally of no interest to anyone but you. 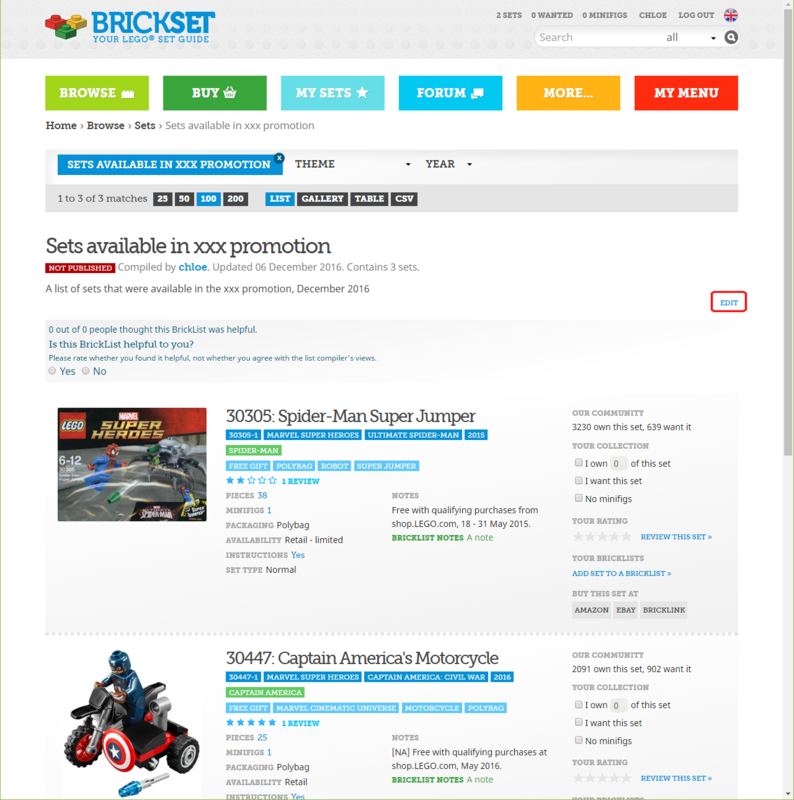 Sets I own/want/Sets for sale/trade -- This is an inappropriate use of BrickLists because recording your collection should be done using the built-in features of Brickset. You can use additional collection flags for indicating sets you have for sale/trade. See the FAQ to find out how. All Nexo Knights Polybags -- There's no need to create lists such as this because the information is already in the database to enable it to be generated. Sets with the most parts -- Again, there's no need to use BrickLists for this because it is better and more easily accomplished using a query. Lists such as these that are marked as public will be unmarked. Take a look at helpful BrickLists to get an idea of what other people find useful. If you have any questions, get in touch via the contact form below. Have fun BrickListing! Thank you for this very informative tutorial. I have one request: replace those up and down links with drag and drop. ^ like my one for fork-lifts, http://brickset.com/sets/list-30 , it's OK, but is largely obsolete now given Technic tractors can be listed by filtering on tag: http://brickset.com/sets/theme-Technic/tag-Tractor . @Huw. I think it would be very useful to have some way to categorize minifigures. If minifigures were tagged like sets (in addition to the already existing specific character name tag), then one could see a list of all minifigures of a certain type (such as droids, imperial, jedi, ninja, or roman). If bricklists could include both minifigures and sets, then lists of unrelated minifigures not covered by tags could be made (like "Minifigs designed by --- graphic designer" or "2016 SW promotional minifigs"). This is useful for me as a SW droid collector because there is currently no good way to view all the SW droids in one consolidated list. I have made Wanted Lists on BrickLink for this purpose, but it is not as reliable for me. 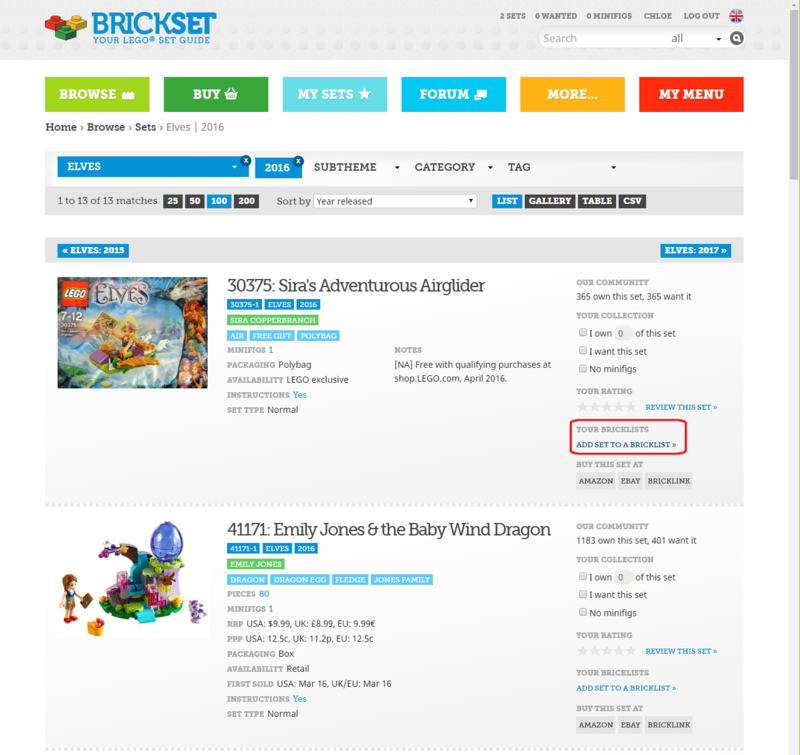 On Brickset, the closest existing thing to this feature is the combined want/own collection page. Since a majority of my minifigs (want & own) are SW droids, I have a relatively uncluttered SW droid list. But, if I want to see a list of all Imperial troops on Brickset, looking at my collection page won't work. If I had to pick which feature I would prefer, it would be tagging because it would fulfill my need for related minifigs similar to the Tractor tag from above. - My bricklist of farm tractors only includes sets where the main model is a tractor. The tag list for tractor includes for example #8835 Forklift because it's B-model is a tractor. - More importantly, the tag lists don't have comments. I like the 'Add this set to a bricklist' option, that's very useful. Can you implement drag and drop for ordering lists? ^ It's on my to-do list. Great! Thank you for this feature. This is a nice tool that i may use sometime thanks for the tutorial. The other list I made attempts to tell the story of Lego Trains through the ages. I don't see that fitting any of your categories, but I find it useful to provide an overview of the 40+ year running Train theme without getting overwhelmed.